Home » Dragons » Numbers » Picture Books » Reviews » Reviews by Sarah » Sarah Steed » Review: Have You Seen My Dragon? Review: Have You Seen My Dragon? Have You Seen My Dragon? is one of the most fun and creative counting books I’ve read in a long time. It’s also got a search-and-find element. A young boy has lost his dragon. He must be somewhere in the big and busy city, so the boy goes looking for him. He sets out from an apartment building looking for one dragon. Perhaps it stopped for a hot dog (the boy has two of them), or rode into town on the bus (the boy sees three of them). And so the story goes. At each ‘stop’ along the boy’s journey, the numbers grow, all the way up to twenty. Each illustration by author-illustrator Steve Light is a double-page spread, and almost exclusively black and white, with the exception being the numbered item which is mentioned - six brown monkeys in the zoo, or seventeen yellow taxis, for example. This approach highlights each coloured item so they really pop off the page at you. And if you look closely, the missing dragon can be found hidden somewhere in each picture, always a step ahead of the boy. The illustrations all provide lots of details to examine in the cityscape, and some are cross sections of above and below ground, or different perspectives of tall buildings. The dragon’s final destination, and the successful culmination of the boy’s search, feels entirely appropriate, and it’s one which you may be able to guess if I tell you it’s decorated with twenty red lanterns. Have You Seen My Dragon? is bound to be enjoyed by many children, and has certainly made my list of favourite picture books. Be sure to also take a look at the endpapers which feature a stylised street map depicting the route the boy takes on his hunt for the dragon, with numbers marking the spots in each of the pictures. 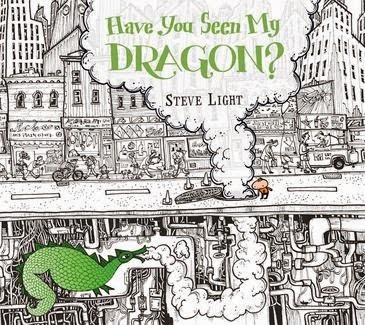 You can check out Steve Light’s Pinterest board, too, where you’ll find some early sketches and storyboards for Have You Seen My Dragon? Title: Have You Seen My Dragon?